Covert gadgets don't always have to be used for spying. 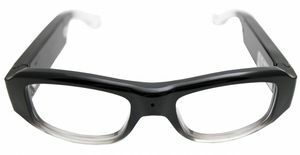 Between assignments you can use this ultra-advanced pair of glasses just to give yourself that trendy intelligent look. When duty calls though these specs are ready to go to work. The internal memory ensures you're always ready to record. Transfer files to and from your computer easily with the included USB cable.